Robert "Bob" Cunningham Lowry of Sarasota, Fla. died peacefully January 4, 2014. Lowry was born August 24, 1942 in Jackson, Miss. to the late Robert Dindinger and Betty Sue Cunningham Lowry. An 8th generation Arkansawyer, he was a direct descendant of Little Rock's first mayor Dr. Matthew Cunningham. After briefly living in New Orleans and Boston, the family returned to Little Rock which would be his home for more than 60 years. 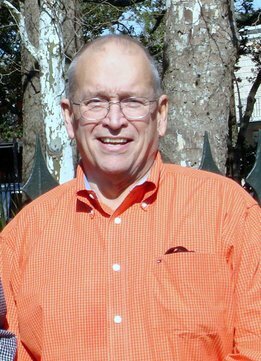 Bob was an early board member of Youth Home, a member of the American and Arkansas Bar Associations, past member of Rotary International (Downtown Little Rock), and served on the Little Rock Planning Commission. He is survived by his partner of many years Delton "Sonny" Scroggs of Sarasota, former wife Catherine Ostner Lowry of Little Rock, son Robert William Lowry of Little Rock and Clarksville, daughter Mary Catherine Lowry Ford (Jonathan) of Shreveport, and grandchildren Mary Chandler Louise Ford and Jackson Eli Lowry Ford also of Shreveport. Following a private burial at Mt. Holly Cemetery, a memorial service will be held Saturday, January 11 at 10 a.m. in the chapel of Second Presbyterian Church, 600 Pleasant Valley Drive. Dr. Karen K. Akin will preside. In lieu of flowers, the family invites memorials to Youth Home, Vera Lloyd Presbyterian Family Services, Our House, or the charity of the donor's choice. Arrangements by Ruebel Funeral Home, www.ruebelfuneralhome.com.